Donat Schöffstoss (1773-1811) was the son of organ builder Franz Schöffstoss. 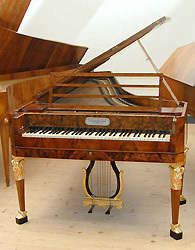 As a young child, his father deceased and his mother soon married the successful instrument builder Anton Walter (1752-1826). Donat and his brother Joseph became their stepfather’s apprentices and soon learned how to produce their own instruments.